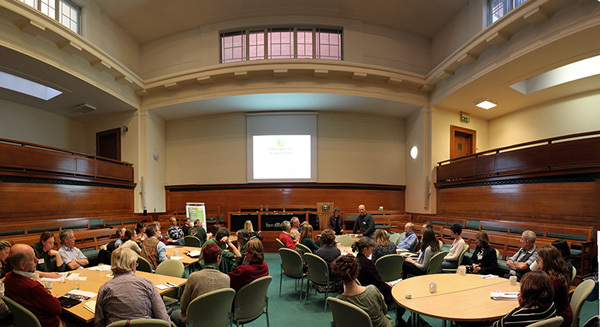 The 5th Let Nature Feed Your Senses Conference took place at the Priory Meeting Rooms in the centre of Birmingham on Wednesday 19th November. 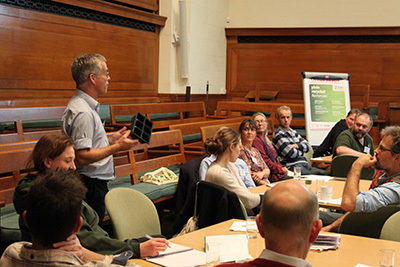 Around 50 people came to an interesting and informative event that explored the benefits of activities and sensory-rich opportunities on farms as well as examining the challenges of sustaining visits in challenging economic times. Our speakers gave us lots to think about from a range of different perspectives. Sarah Preston from Natural England stepped in at the eleventh hour for her colleague Jim Burt who was unfortunately ill and was unable to make the conference. Sarah’s presentation summarised the current public health situation with regard to health inequalities in the UK and the role that access to greenspace and care farms can play. You can download Sarah’s presentation on Natural England’s health, wellbeing and greenspace research here. The public health situation from a local authority perspective was given by Angela Blair from Sandwell Council . Her presentation explained how the Council is connecting an urban population with their local greenspace and specifically with local food production and healthy eating as a way of addressing the health inequalities that exist in their community. You can download Angela’s presentation on public health in Sandwell here. Sarah Giles from FAI Farms spoke about Farm Ability, a part of Let Nature Feed Your Senses since the beginning, and the transformational impact that their farm-based day service is having for the adults with autism and learning disabilities taking part. Sarah took the conference on Farm Ability’s journey from social care to social change and from well being to work skills as she emphasised the impact and importance of meaningful employment and activity for their service users. You can download Sarah’s presentation on Farm Ability here. Plenty of time was allowed for discussion and networking and after a very tasty lunch from the Priory Rooms we had a choice of three workshops, in the time allowed each person attended two of the three. The subjects for these workshops were “Local champions and building the networks” led by James Taylor, once a project coordinator for Let Nature Feed Your Senses and now a farmer and care farmer on the family farm (www.broughtongrounds.co.uk), “Building long term relationships” led by Ian Eggington-Metters from Care Farming UK, and “Evaluation and evidence” led by Stuart Spurring from the Sensory Trust. You can download James’s presentation on Broughton Grounds here. In the final session of the day we heard three different ways that solutions had been found to funding visits with presentations from Julian Davies (who talked about ways in which to overcome the challenge of charging schools for visits), Wendy Gray (who talked about sharing skills and charging for activities) and Claire Morris (who talked about the opportunities and challenges that came with a new classroom on the farm), followed by questions and further discussion. Caroline Drummond LEAF Chief Executive summed up what had been an enjoyable, enlightening and informative day, a time to meet new people and catch up with old friends, and an opportunity to keep the Let Nature Feed Your Senses approach alive! 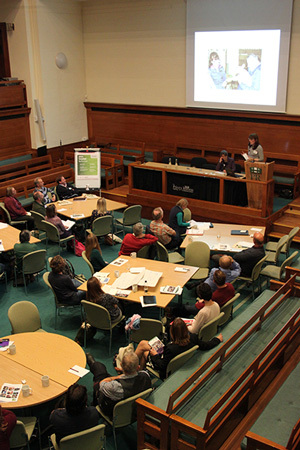 The Let Nature Feed Your Senses conference was followed by Care Farming UK AGM, which included an informative presentation on Commissioning Services by Amanda Ridgewell, SEN & Disability Services, Redbridge (you can download Amanda’s presentation on Commissioning Services here).